The award-winning F110 is a true revolution in rugged tablet computing. The F110 combines powerful 5th gen Intel Core Processors, the latest wireless and a large 11.6 inch widescreen display with a thin and light design that re-defines rugged mobility. The 2nd generation Getac S410 Notebook delivers landmark performance, security, customization and durability unseen in a semi-rugged laptop this thin. Experience the fast 8th generation Intel® Core™ i7 processor, airtight security tools with multi-factor authentication and customization features to fit any workflow – all engineered into a thinner, more durable design. 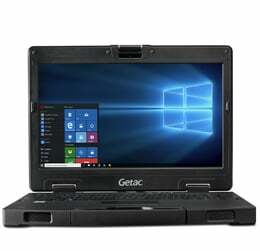 The breakthrough design of the Getac V110 fully rugged convertible enables the computer to be amazingly strong while also being unbelievably light. It truly is a revolution in rugged computing. At 68oz and 34mm thin, it's 28% lighter and 30% thinner than the previous generation.